Click Here to Advertise for Free ! Welcome to our Marine Services Directory. Please navigate search this directory for the services you require using the Navigation tools on the left side bar. We work with the best international Naval Architects and Yacht Designers and passionately committed to quality work at the best possible prices. 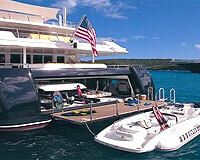 We have built and refit 25 yachts in Thailand and South East Asia during the last twenty years. ASK Yacht Design is a group of individuals specialised in Interior & Exterior Styling, and Naval Architecture. We offer our clients flexibility by providing either a full or partial service. Our full service comprises a complete design process, from concept designs to the construction surveys. Journey Catamarans was developed by Bay Island Yachts Team based on their many years of experience of selling catamarans.... Their main office is based out of Alameda, CA ( San Francisco Bay)......The wave piercing hull design is in use worldwide by modern passenger and cargo ferry catamarans. The main reason is they achieve a higher top speed, smoother ride and much better fuel economy ! The is the first production power catamarans using this innovative hull design. Bluethumb Design Studio : a full Interior design services presenting concept, styling ideas, thinking out-of-the-box, and working within vessels constraints to produce construction, production and shop drawings. An Interior Designer can plan for style, comfort and safety calculating the design environments for ergonomic challenges and functionality taking into close consideration the vessels mechanics. Our forte is taking these constraints and designing around them. Boats and Yachts Ltd is trying to find the right boat for the right person in Hong Kong and the Asia Pacific region, offering a brokers portfolio of leading Cruisers, Sped boats, Liveaboards, Junk boats and Sailing Yachts for sale. Our experienced team can help suport, advise and assist you in every aspect of finding the right vessel for you. We conduct all aspects of the sale from inspection, overseeing surveys, executing closing documents, Marine Department, registration, and recommendaing insurance companies. Giving you the peace of mind that everything is taken care of and that you are receiving the right deal for you. Chelsea Naval Architects provides private clients and shipyards with motor yacht design from initial concepts to shop drawings. From wood to composite, aluminum or steel and easy access to world class testing facilities, Chelsea uses the latest design tools to enhance its team's long experience. “Provide luxury Motor Yachts on a turnkey basis with as much appeal to the owner's checkbook as his love of the sea and beautiful yachts". Italian Yacht Designer Gino Gandino has been offering unique Euro styling for over 30 years. His reputation is verified by the quantity of Owners, Boat builders, and Dealers from diverse parts of the world that prefer Gandino designed Yachts to built custom or production yachts. Hong Kong Catamaran Club provides ASA sailing training, boat charter, sailing experience at Hong Kong. Come and have fun with us! Our Vision is to design, develop and build a complete range of boats that are both technically advanced and aesthetically superior. In doing so, the company seeks to set new standards of both performance and aesthetics for all future catamarans. Founded in 2008, as an autonomous division of Zhejiang Aluminum Industries Group, we have benefited greatly by the solid financial backing of our parent company, and a well founded team of international designers, on site management team and engineers, accompanied by some of the best boat “hands on” boat builders available anywhere. Unique expertise in top of the range 20-45 metre semi-custom & performance yachts. The Royal Passagemakers are hand built in Canada approximately 98% inhouse to enable us to have the highest quality control in the boat building business. Benefits of building in Canada include, vessels built in Canada for export leave Canada duty & tax exempt at this time. Ricotech Industrial Ltd. started it's precision mould business in 1998, more than ten years experiences enabled us to solve all the problems in mould area, such as cams, slides, lifters, core pulls, undercuts, sharp corners, square corners, deep ribs, automatic actions.We provide the best suggestion of your mould and your part, and we try to find the best way to satisfy you with high quality, low cost, and fast delivery. Shenzhen Chenyi Design Co., Ltd. specializes in branding strategy, brochure and logo development, vitual imaging, packaging and show poster design. Our complete service includes expert design, customer follow up, short run and production printing work. Our broad experience includes venues such as Fashion, IE Manufacturer, Restaurant, Finance, Hardware & Lavatory, IT, Marine Industy, Electronics, Medical Care and Jewellery etc. Shenzhen Funshion Translation was founded in 2009, already earning solid and stable relationships with international companies and individuals. We provide good quality translaiton and interpretation, in a wide range of professional translation venues. They include document translation, factory tours, checking goods, conventions/exhibitiions, business meetings, as well as informal daily accompaniment. Our service covers electronics, plastics, metal hardware, garments, food, arts and crafts, literature, finance, etc.